Dental implants are currently the premier tooth replacement solution available today. With this treatment, your missing teeth will literally be restored from the root up, giving you the most natural-looking and longest-lasting results possible. Our team of dentists has teamed up with local oral surgeons to rebuild thousands of smiles using implants over the years, and whether a person is missing a single tooth or an entire mouthful, the end product is always a renewed and beautiful smile. Are you ready to say “goodbye!” to the gaps in your teeth? If so, contact us today. If you are missing a single tooth, our team will use what is called an implant-retained crown to bring it back. 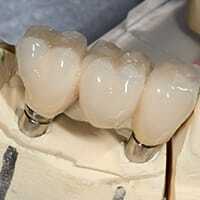 It will consist of three main parts: an all-porcelain dental crown, an abutment, and the dental implant itself. The implant is actually a small titanium post that will be placed into your jaw to mimic the root structure of your lost tooth. The crown will be connected to it via the abutment, and the end result is a new tooth is virtually indistinguishable from those around it in both look and function. And, if you are missing a few teeth in a row, we can actually use these implant crowns to replace them without having to sacrifice neighboring healthy teeth (which is the case with a traditional bridge). One implant crown will be placed on either side of the gap in your smile, and these will be bonded to prosthetic teeth to close it. This will not only restore your smile’s appearance, but it will also prevent the surround teething from drifting into the space (which often happens). A Stronger Fit: Because the implants anchor the denture to the jawbone, it has a much more secure fit compared to a regular denture. More Consistent Fit: The implants actually help the jaw maintain its shape and strength over time, ensuring the denture will keep its original fit for much longer. 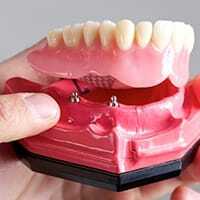 Stronger Bite: Implant-retained dentures enable a patient to have a bite force much stronger compared to a traditional denture, allowing them to enjoy a much more varied and healthy diet with relative ease. If you are missing an entire arch of teeth and want a strong, reliable denture, you can get one in literally one day thanks to All-on-4 dental implants. This treatment is ideal for patients who have a thin or brittle jawbone due to tooth loss as the implants used are longer and thicker than normal. They’ll be placed by a local oral surgeon, and then they will be attached to a temporary denture to give a patient a complete smile. Then, over the next few months, our team will help them design their ideal denture so they can achieve a fully functional smile they can always rely on.